Nothing stops Mookie when he's on the job. "I loved the intensity of flaws each character possessed. There wasn’t a single soul (or nonsoul) in this story who didn’t have some gigantic flaws and they seemed ripe for the pickin’ and boy does Chuck know how to do it." 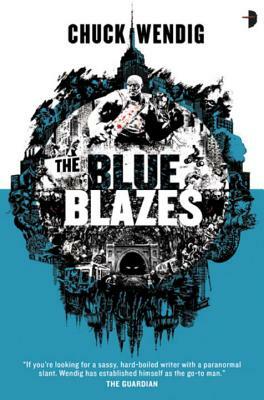 "So if you need something dark, gritty, and fun, I recommend The Blue Blazes." "In the end, The Blue Blazes is a blast, an awesome, smartly written novel that far exceeds the sum of its parts"
"…a heart-stopping ride from beginning to end. I think it is my stand out book of the year..."
"Rounded off with an emotional finale, The Blue Blazes is a serious contender for book of the year." "It’s a brilliantly imagined world, as ick-inducing as it is, and it’s easy to see Mookie’s place in it."